A summit without substance ttps://www.washingtonpost.com/news/global-opinions/wp/2018/06/12/a-summit-without-substance/?noredirect=on&utm_term=.8a94c9a95b12By Max Bootm June 12, The Singapore summit was a mesmerizing spectacle utterly lacking in substance. In other words, it was a perfect microcosm of the Trump presidency. I guess it all depends on what your expectations were. If you took Trump seriously when he claimed on April 22 that Kim had “agreed to denuclearization (so great for World),” then you are bound to be disappointed. If, on the other hand, your expectation was that North Korea would string Trump along with meaningless verbiage, then the summit was precisely what you expected. The meeting really should have been held in Oakland, not Singapore, because there is no therethere. Trump and Kim agreed to four points. The first was empty blather about the United States and North Korea desiring “peace and prosperity.” The second was more empty blather about building a “lasting and stable peace regime.” The fourth was a microscopically small commitment to the repatriation of the remains of Korean War POW/MIAs. The key point was No. 3 — “Reaffirming the April 27, 2018, Panmunjom Declaration, the DPRK [Democratic People’s Republic of Korea] commits to work towards the complete denuclearization of the Korean peninsula” — and on closer examination it, too, is empty blather. I can commit “to work towards” beating Roger Federer at Wimbledon, but that doesn’t mean that I will ever reach the goal. Perhaps this time will be different and Kim really, truly means it. If so, we will find out soon enough, because he will agree to the “complete, verifiable and irreversible” disarmament that the Trump administration had initially insisted upon. But there was no mention of those words in the Singapore Declaration, just as there was no mention of human rights. Trump assailed the Iran nuclear deal as the “worst deal ever.” The deal he struck with North Korea is far weaker. What’s NOT in the summit agreement ?- that’s the revealing part. “……..it is not so much what is in the joint statement as much as what has been left out that is the big story. To tease this out, let’s consider the four specific points of agreement articulated in the joint statement released by US President Donald Trump and North Korean Chairman Kim Jong-un at the conclusion of today’s summit…..
…….. My take-home message from the omission of CVID from the joint statement is confirmation that North Korea under Kim Jong-un is never going to willingly denuclearise. 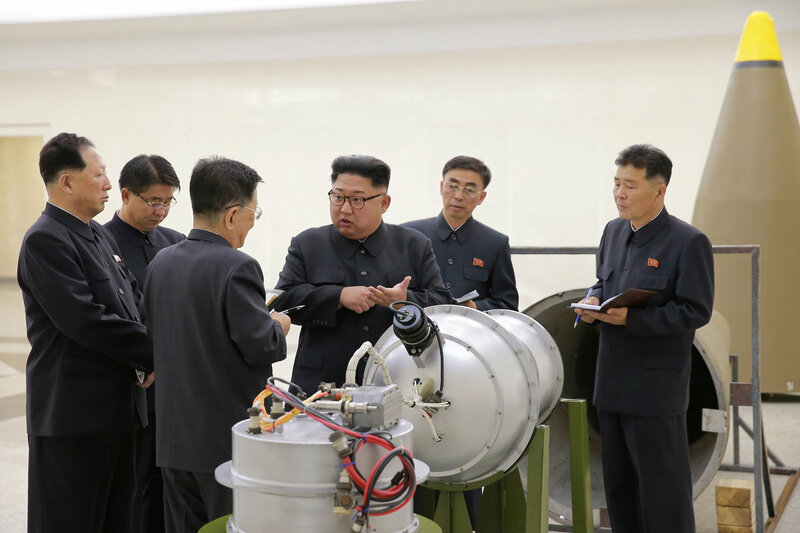 In “working toward complete denuclearisation,” North Korea may agree to a nuclear weapons and ballistic missile testing moratorium, decommission obsolete nuclear facilities, or even promise to freeze production of new nuclear weapons, without ever having to compromise its nuclear weapons capability……..
Editorial A confident leader strode into the Singapore summit and won. Kim Jong-un went with a plan, gave little and left with plenty: bolstered status and diplomatic leverage, lavish praise from the US president, the promise of an end to US-South Korean military drills – and, surely, a growing confidence that North Korea is doing well at this game. A meeting supposed to effect a breakthrough on denuclearisation looked “more like a big welcome party to the nuclear-armed club”, in the acid but accurate words of one observer. Better than war, for sure. But since it was Donald Trump who raised that spectre, giving him credit for dispelling it would be like calling a man a life-saver when second thoughts stay his hand from murder. The US president handed over gift after gift in exchange for the inflation of his ego. He does not know or does not care that his country went home poorer than it came. The language in the joint statement was weaker than in previous agreements– the very significant difference being that the North is now much further advanced in its nuclear programme. There was not even a pledge that either side “shall” take action; just the assertion that North Korea will “commit to working towards” denuclearisation, which it sees as a general, not unilateral, process. President Donald J Trump of the United States of America and Chairman Kim Jong-un of the State Affairs Commission of the Democratic People’s Republic of Korea (DPRK) held a first, historic summit in Singapore on June 12, 2018. President Trump and Chairman Kim Jong-un conducted a comprehensive, in-depth, and sincere exchange of opinions on the issues related to the establishment of new US-DPRK relations and the building of a lasting and robust peace regime on the Korean Peninsula. President Trump committed to provide security guarantees to the DPRK, and Chairman Kim Jong-un reaffirmed his firm and unwavering commitment to complete denuclearisation of the Korean Peninsula. Having acknowledged that the US-DPRK summit — the first in history — was an epochal event of great significance and overcoming decades of tensions and hostilities between the two countries and for the opening of a new future, President Trump and Chairman Kim Jong-un commit to implement the stipulations in this joint statement fully and expeditiously. President Donald J Trump of the United States of America and Chairman Kim Jong-un of the State Affairs Commission of the Democratic People’s Republic of Korea have committed to cooperate for the development of new US-DPRK relations and for the promotion of peace, prosperity, and security of the Korean Peninsula and of the world. Scientists predict millions of climate refugees – but where will they go? A group of scientists, including one from the University of Arizona, has new findings suggesting Antarctica’s Southern Ocean — long known to play an integral role in climate change — may not be absorbing as much pollution as previously thought. To reach their contradictory conclusion, the team used state-of-the-art sensors to collect more data on the Southern Ocean than ever before, including during the perilous winter months that previously made the research difficult if not impossible.The old belief was the ocean pulled about 13 percent of the world’s carbon dioxide — a greenhouse gas that contributes to climate change — out of the atmosphere, helping put the brakes on rising global temperatures. …….. scientists know less about the Southern Ocean than the rest of the world’s oceans. What they do know is mostly limited to surface CO2 levels in the summer, when it’s safer to take measurements by ships with researchers aboard. Shipboard sensors that directly measure CO2 are the accepted scientific standard in these types of studies. fundamental problem with the project: it’s a rip-off. expensive” by the spending watchdog. It is not a good yardstick. consumers pay through the nose when there are lower-cost alternatives? changed their lives and benefitted the diverse regions where they live. Club about the energy revolution in America. more, automation is putting people out of work. jobs in renewables throughout the U.S.
delays are accumulating on the site of the EPR Flamanville in the Channel.